5 things you need to know ahead of this year’s NHL Stanley Cup Playoffs, which starts today (April 10th). Through the course of the season, Tampa Bay proved itself to be the best team. The Lightning set multiple records with 128 points, and tied the 1995-96 Detroit Red Wings for the most wins in a regular season with 62. Nikita Kucherov had 128 points, more than anyone since the 1995-96 season. The pressure is now on for Kucherov, Steven Stamkos and Co., to prove that their hard work means something. The Capitals are vying for a repeat this year for a second championship win, having finished first in the Metropolitan Division. The Capitals play their first game against the Carolina Hurricanes this Thursday, April 11th. The Golden Knights and Sharks will face each other again in the 1stround of playoffs with their first game on Wednesday, April 10th. Golden Knights defeated the Sharks in 6 games in the second round last season. Maple Leafs fans lives have been immeasurably better with John Tavares joining Toronto. Tavares reached a career high of 47 goals and 88 points in his first season in Toronto. Toronto has high hopes for championship, with Tavares bolstering a high-scoring Leafs’ offence. Canada is hoping for its time with three teams aiming for the first Canadian champion since the Canadiens took home the Stanley Cup in 1993. The Calgary Flames are the top seed in the Western Conference with their first game against the Colorado Avalanche on Thursday, April 11th. 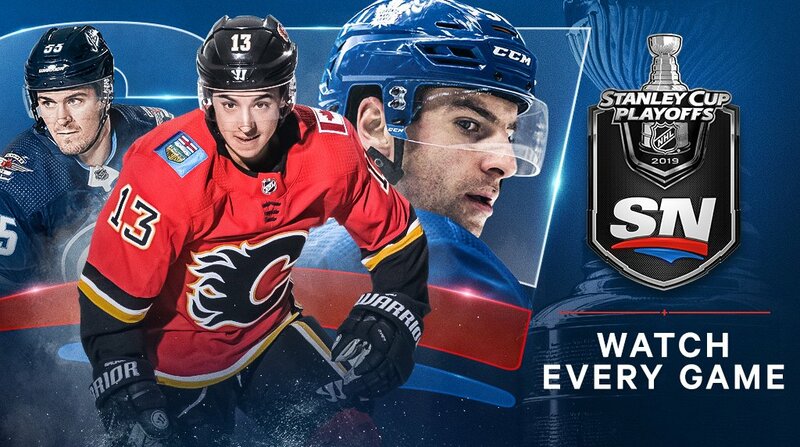 Catch all of the playoffs action with Sportsnet and CBC in VMedia’s Premium Sports TV package, that also includes a great set of popular sports channels, including MLB Network, Golf Channel, TSN, Sportsnet One, NFL Network, FOX Sports Racing, Game TV, and BIG Ten Network. Alternatively, add Sportsnet or TVA Sports to your existing TV line up through one of our value –packed sports theme packs, including: SuperSports Pack, Sports Combo, TVA Sports, SportsMan or Sportsnet Plus, starting from as little as $6.95/month. VMedia- More Sports. More Enjoyment.